Despite rain, Indians remain upbeat and keep winning. The constant drops of rain did not damper the team effort of the Cleveland Indians last night as Ryan Garko, Asdrubal Cabrera, and Kelly Shoppach all had solo shots. In between was added a 2-run homerun by Mark DeRosa. It was nice to hear the roar of the crowd and the BOOM from fireworks four times throughout the night. I was not able to cheer or observe as well as I would like so it was great to be able to rely on such a great crowd, not in terms of size but in terms of great enthusiasm. Tampa added a solo shot of their own when he hit his 16th homerun as he continued to lead the American League and was only one homerun shy of a tie for the Major League lead in homeruns. For the most part though, Cleveland pitching kept Tampa from getting a rally going as they were held to the 1 run on 6 hits. Evan Longoria, B.J. Upton and Gabe Gross went a combined 0-11 with 1 walk and 2 strikeouts. There were seven strikeouts in all. It was wonderful to get a win without sweating it out from the bullpen or relying on some comeback to pull us back from the jaws of defeat. I was thinking it might be a long night due to all the rain and delays. However, it turned out to be an awesome night as I was able to get home at a decent hour. Due to the awesome power-led win, the Indians are now 19-28, 9 GB from being average. Noteworthy news: What is up with Grady? Well, according to Anthony Castrovince, he may end up having to go on the DL. Stay tuned. Called up as insurance is Trevor Crowe. I surely hope Crowe’s production can pick up if Grady does go on the DL. It will really benefit the team to see Crowe excel his way to the top while he spends time up here. Anytime you can get quality production from utility players, your team becomes that much stronger. I want to see us make a run at this division. We can only do this by winning. I’ll be down at Progressive Field as a fan tonight. I hope to see Zach Jackson help to continue the winning ways as of late for the Tribe. It will boost our efforts if we can win while others are on the shelf for a while. Speaking of one of those DL players, I saw Anthony Reyes last night. He appeared to remain positive from what I could tell even though the possibility of surgery for him is looming. Best of luck to him and all of the Tribe! This decision has me excited! This news brought welcome relief to my weary soul. With the World Baseball Classic over, I have prepared myself to move forward. Yet, yesterday, I found myself dragging myself down wondering what I should write about. I just wrote about the NL West and what I hope to see in 2009. More previews will be coming. Yet the state of the Indians seemed to be stalled. 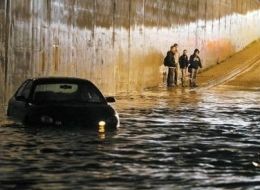 With all the rain today in the Cleveland area, I felt like this car. C’mon, move already! My ideas and motivation felt stranded. I just could not get the energy to move out of this mess. Another 2-2 tie. Everything just is not coming to me. Suggestions from friends and family and co-workers ranged from “Write about the recent cuts the Tribe made.” to “Write about the NL Central” to “take the rest of the preseason off.” After taking all these suggestions to heart, the news came across the wire that helped me use the rain to my advantage and get the car, or in this case, “talk about the Tribe” moving again. All of a sudden, I went from feeling hopeless to feeling like Gene Kelly. The car loaded with ideas was moving and I was rejoicing over the news of the starting rotation being set. My soul exhaled with euphoria over this decision. “Finally” I thought, for better or worse, what a great relief! I was definitely thinking “for the better”, however. I am definitely excited when I see this rotation. Although Cliff Lee had a career year in 2008, he goes into 2009 with a great attitude and wanting to give the Indians the opportunity to win each and every game he pitches. If he can give us 15 or more wins, I will be satisfied. I am looking forward to seeing what he can give us this 2009 season and how we respond. Fausto Carmona is looking like the true ace of our staff so far in 2009. However, it has been Spring Training. 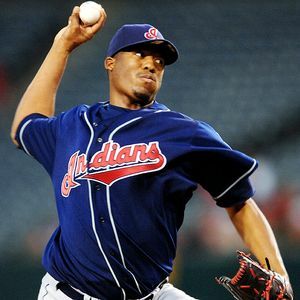 If you would ask me to decide, I would make Fausto the #1 starter. However, Cliff has the experience of acing the staff last season down the stretch after CC Sabathia was traded. Being the defending 2008 Cy Young Award Winner gets him the ranking. However, one can bet that like in 2007, if Fausto can become the #1A or true #1, Cliff Lee will not be upset and the team will benefit from this decision tremendously. I hope Fausto can stay healthy down the stretch and really make this team great again. Carl Pavano is the unproven #3 who we are banking on to be like he was with the Marlins. It is my hope that I see solid efforts from Carl keeping us in games and making the games interesting for our team. If we can recapture that “promised” effort seen with the Marlins, look out! We are going to be a team to be reckoned with. The key is HEALTH. With good HEALTH, comes WEALTH! Anthony Reyes is our best effort at #4. Hopefully, he can gain some momentum to keep us in ballgames and gain us some much needed wins down the stretch. He will be an asset for us down the stretch if he stays healthy. Finally, Mr. Lewis is one that has shown the maturity that is needed to take the ball when called upon. I really like his emotional makeup and am excited to see how he does as our #5. Bottom Line: With all these starters, there is a confidence that we are sending our best five starters out there. I pray for health and consistency from these men and really think these men have what it takes to take the Indians where they want to go in 2009. This decision has me dancing. I believe these five can help us match up best against the American League. I am looking forward to April 6th now more than I was this morning! Way to go Tribe! I admit I was upset when Grady pulled out of the WBC. I thought there was no point to this over glorified Spring Training. I guess I was too excited in 2006. The USA then was eliminated right off the bat. Now I’m liking what I’m seeing from the USA with DeRosa and South Korea with Choo. I know I am such a homer. I have to admit I’m on the bandwagon with this contest finally. I’m writing this, hoping the Netherlands pulls out their game with the Dominican Republic. I just see them as a team that needs no superstars or headlines, just a heart that will not quit. I hope I can see them go to another round. It just ended as i was typing. The Netherlands are moving on and the D.R. has been upset. USA, South Korea, Netherlands, are gaining my cheers so far. Hopefully more teams will gain my support as the tourney continues. I have my choices but I don’t want to ruin their chances of advancing to round 2 so I will have to see what happens.